With sugar commissioner stepping up action against millers that have failed to pay farmers, distress sale by mills is likely to further reduce the prices. Maharashtra recorded the highest ever production of sugar at 106.08 lakh tonnes (lt) in the state this season. The record production this season, till April 22, however, has failed to cheer the industry, which is reeling under the curse of very low realisation. With sugar commissioner stepping up action against millers that have failed to pay farmers, distress sale by mills is likely to further reduce the prices. Of the 187 mills that had taken season this year, 169 have ended their operations as of April 22. The state has recorded 945.48 lt crushing of cane and the sugar production stands at 106.08 lt, as per the government figure. The present production figure has surpassed the previous record production in 2014-15, when the state had produced 105.14 lt of sugar. By the end of this season, which will be towards the end of May, the production figure in the state is likely to touch 107 lt. The record production has failed to lift the mood of the industry, which is facing the brunt of low prices of sugar. To add to their worries, the sugar commissioner, Sambhaji Kadu Patil, has started taking action, which includes issuance of orders under the Revenue Recovery Code to confiscate sugar stock of mills that have failed to clear their payment to farmers. Till Monday, seven such orders have been issued against mills that have failed to pay the farmers. Sources in the commissionerate say more such orders are in the pipeline. Cane dues in the state as of April 15 stood at Rs 2,277.35 crore with millers paying only Rs 18,120.88 crore as against the total due of Rs 20,088.29 crore. Meanwhile, mills in the state have started distress sale of their stock, which has added to the slide in the prices. 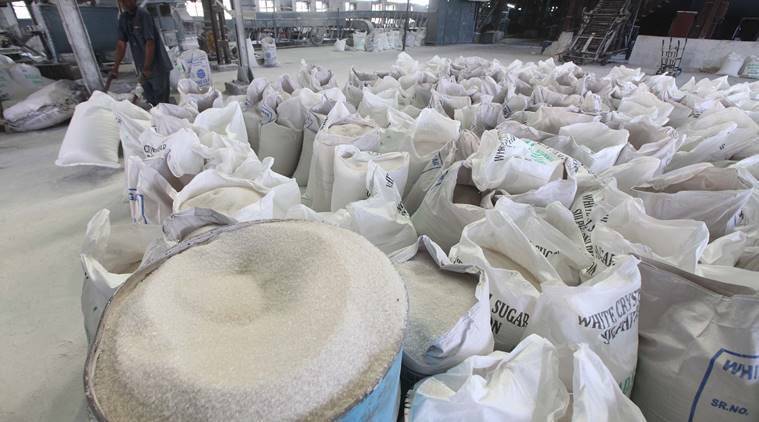 Mukesh Kuvadia, general secretary of the Bombay Sugar Merchants said at present the ex-mill price of sugar in the state is around Rs 25.50-26 per kg. It might be recollected that the season had started with sugar prices ranging at Rs 38 per kg. “The bumper production has slowed down purchase by commercial buyers. Even as summer kicks in, we are yet to see any significant increase in demand,” he said. The trend of distress sales has picked up after the sugar commissioner strarted taking action, which has further subdued the prices. “Many of the mills are short of space to stock sugar and so they are selling it at much lower prices,” he said. Things are unlikely to get better next season as the state is expecting a bumper production of 115 lt.
With just five-six months left before the next season, to start logistics is yet another reason for millers to press the panic button. Kuvadia said the 20-lt export quota issued by the central government seems unattainable. “Even with subsidy the maximum export could be around 8-10 lt while without subsidy, it’s not at all feasible for millers to export sugar,” he said.